The configuration of Premember is stored in a central place located in the main window menu bar. Configuration that doesn’t belong to a particular category. 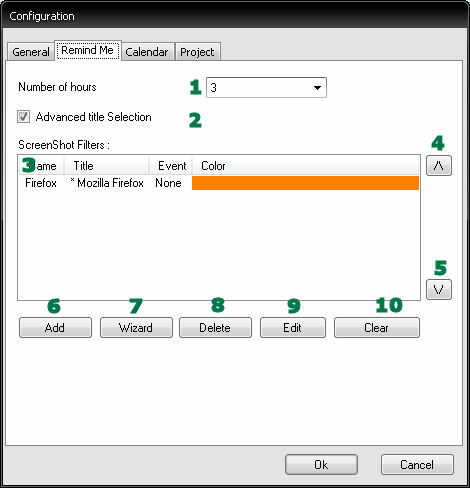 The configuration for the remind me part. The place where Projects and task categories can be managed. The general configuration exists of configuration that doesn’t belong to one specific part of the program. The first work hour of the day . The last work hour of the day. Here you can configure what task categories you want to be visible in the tray icon on the first place. So you can use the start /stop functionality. Here you can configure what task categories you want to be visible in the tray icon on the second place. So you can use the start /stop functionality. Here you can configure what task categories you want to be visible in the tray icon on the third place. So you can use the start /stop functionality. A time notation in the form “hh:mm daypart”. This time notation is mostly used in north America. A time notation in the form “hh:mm”. The number of days the screenshots keep saved. Delete immediately all screenshots except today. The “remind me” configuration provides the configuration for the part that let you look back in time. You can set here The Screenshot Filters so you can see more easily in the “Remind Me” Window what you have worked on. The number of hours that are visible in the vertical hour scrollbar on the remind me window. The modus that is used to configure the screenshot filter. the complete list of all the configured screenshot filters. moves the selected filter 1 place up the list. moves the selected filter 1 position down the list. Opens up a window where you can add a new filter. Will open up a wizard which will guide you through the process of making a filter. Deletes the current selected filter in the screenshot filter list. Brings up a window where you edit the currently selected filter. Will delete all screenshots filters. 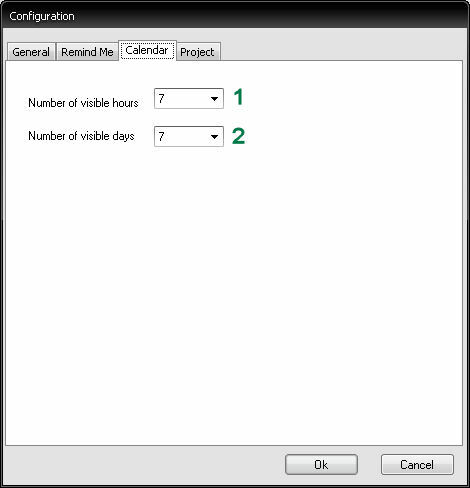 In this part of the configuration you can set the configuration for both the day and the week calendar. The number of hours that are visible in both the day and week calendar. The number of days that are visible inside the day and the week calendar. 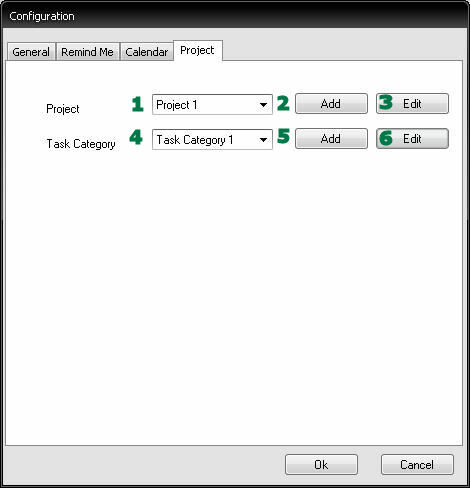 The configuration for the Project and task categories. 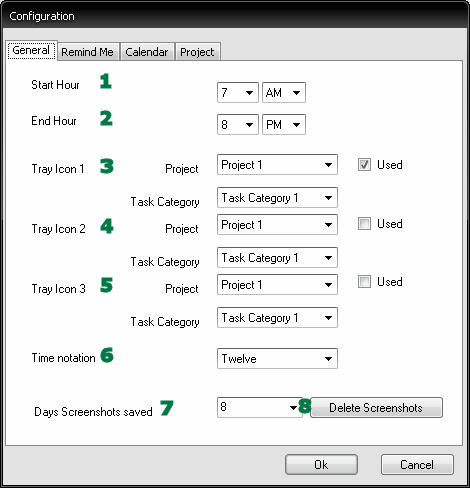 Here you can make and edit project and task categories that are used thorough the program. This is a list of all the projects. Will open up a window where you can add a project. Will open up a window where you can edit the current selected project. This is a list off all the task categories of the current selected project. Will open up a window where you can add a task category to the current selected project. Will open up a window where you can edit the current selected task category.